Discussion in 'Console & PC Gaming' started by GTPNewsWire, Jan 15, 2019. This article was published by Joe Donaldson (@Joey D) on January 15th, 2019 in the Gaming category. It's a long shot, but I want BC added next, with the ability to drive the Coquihalla. Would be a nice circular thing for me considering my dad drove on this roads not long ago. 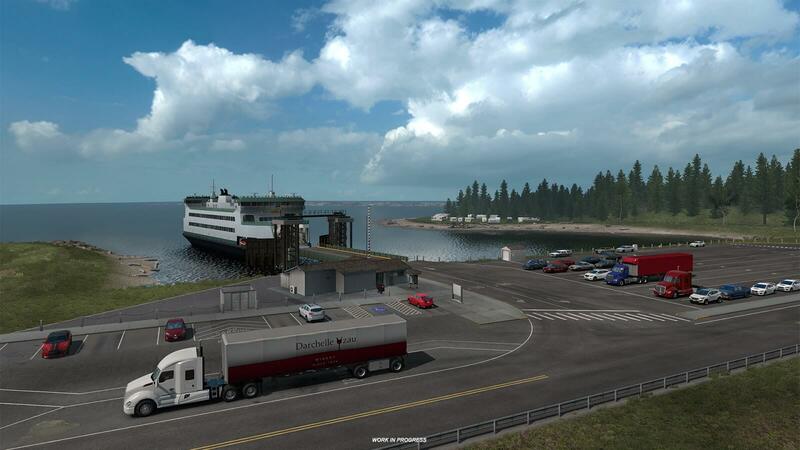 On top of Washington we will also be getting the International Lonestar and Freightliner Cascadia at some point (Source). Hopefully they keep building the map until it's as built up as the European one. BlacqueJacques, TheNuvolari and Joey D like this. Might get me back into playing it, but when you think about it, at this rate we will all be long dead by the time the entire US is done. Certainly possible, considering Alaska is a crucial addition for the future given it has probably the most famous truck scene in the states and BC is required to get there. One state away from me. Might look into making this run on my Mac depending on how expansive it is. Both the American and European versions are on sale for $5/each for the base game until the 21st on Steam. All the DLC is also on sale for a good discount. Price wasn’t a concern, I’m interested in how much detail goes into Washington. That shot with the ferry looks really accurate but I’m (edit) not* super familiar with the other areas in the state thatve been shown off. Price wasn’t a concern, I’m interested in how much detail goes into Washington. That shot with the ferry looks really accurate but I’m super familiar with the other areas in the state. I haven't played the game for a while, did they ever fix the eardrum shattering volume levels for the weigh station alerts? Great, the more green the better! Hopefully they can release this a bit earlier this year. ImaRobot and TheNuvolari like this. Utah is rumored to be next in line after Washington. I better be able to deliver huge trailer loads of green Jell-O. Texas probably isn't far behind. Now that they have a relationship with all the major parent companies hopefully they can get Mack and Western Star into the game. SCS has confirmed what we already knew. There's some new screenshots of the expansion though. Let's hope there'll be a new rig for cruising in Washington... International Lonestar anyone?